"There is a large concentration of naval and aerial forces in the Eastern Mediterranean, far more than were required to administer last night's slap on the wrist to Assad. The Pentagon declared it was a 'one-off strike' to serve as a warning, apparently to save face after all the preparations and bellicose rhetoric, but the Truman Carrier Group is still underway to the region. Why raise the stakes, and escalate the situation? Perhaps the real target is not Syria, but Iran? Or would it be inconceivable for the US naval forces, including submarines, to pass the straits and enter the Black Sea to confront Russia more directly? I submit that a false flag attack that can be blamed on Iran would indicate the former, while 'developments' in Ukraine could lead us to the latter nightmare scenario. In any event, Erdogan will have to go, in order to be replaced by 'our man' Fetullah Gulen, who will be able to accept an autonomous Kurdish region, keep Turkey in NATO orbit, and act as bulwark to expanding Russian and Iranian influence in the region." 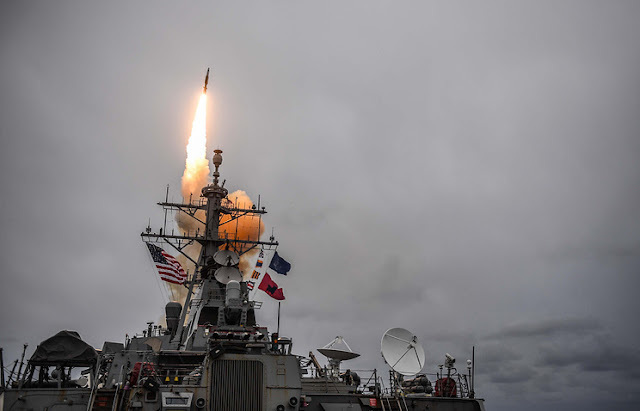 Texto: Early on April 14, the US, France and the UK carried out a massive missile strike on Syria justifying their actions with the alleged involvement of the Assad government into the April 7 Douma “chemical attack”.